Some of the new user access control features drive me nuts. For example I can't stand it when you open a non-user file in notepad, only to get an access denied message when you save it. Yes I know I could start notepad as administrator and browse to the file again. But that kills me every single time. Years ago I used to add notepad to my 'Send to' menu and decided it was time to resurrect that practice. Open Windows Explorer and type shell:sendto in the address bar. Click the Windows/Start button and type notepad into the search box. Right-click-drag Notepad to your 'Send to' folder and select "create shortcut here". 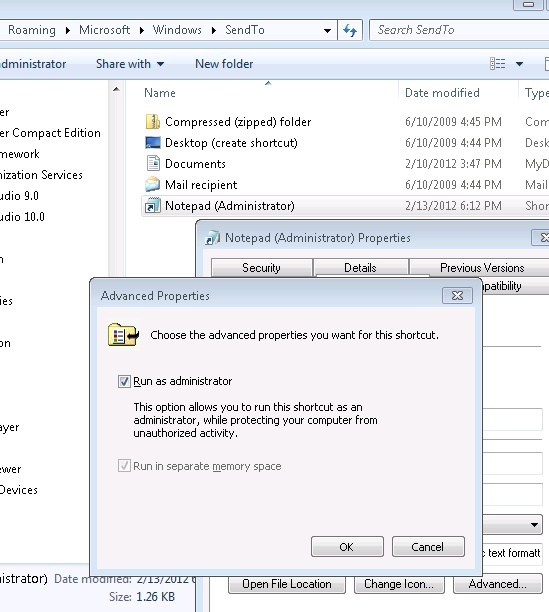 In the properties of the short cut, click advanced, and check the 'Run as administrator' box. Now we've got a quick way to edit a file without browsing to a folder twice. But this got me thinking. It would be nice not to have to copy and paste the path when I need to work in a folder with a command prompt. From the notepad example above, it's pretty obvious that the path is sent as the first parameter to the shortcut command. We can take advantage of that for a new command line shortcut. Click the Windows/Start button and type cmd into the search box. 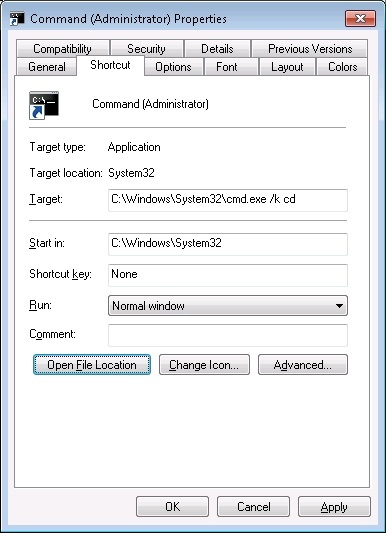 Right-click-drag cmd.exe to your 'Send to' folder and select "create shortcut here". Click advanced, and check the 'Run as administrator' box (optional).